Mango coat (similar here), Barney's Originals leather jacket, Thrifted silk blouse by The Reformation, Zara plaid pants (I love these too), Vintage studded crossbody bag, Antique rings, River Island zip-front boots (last seen here). Shot by Isaac Lacey. Plaid has always been one of my favorite patterns, and looking at these pics I honestly don't know why my closet isn't loaded with way more. I love the subtle rocker vibe that these pants give off (I wore them the other day and a friend commented that they were very 'St. Laurent,' which is just about the best compliment you can give anyone, right?) and a vintage studded bag and some platform boots perfectly sealed the deal. I also have some crazy news to share with everyone! You know that competition I entered this week with inappropriate images of me in a swimsuit and vintage coat on my roof in the freezing cold?! Turns out I WON! Thanks to Bryan Boy and Stylight I'll be heading to Berlin Fashion Week this Sunday to join them at the 2015 Stylight Fashion Influencer Awards. I honestly couldn't be more excited! It will also be my first time in Berlin, so if anyone has any recommendations for things to do, see, eat or drink there, I'd love to know! 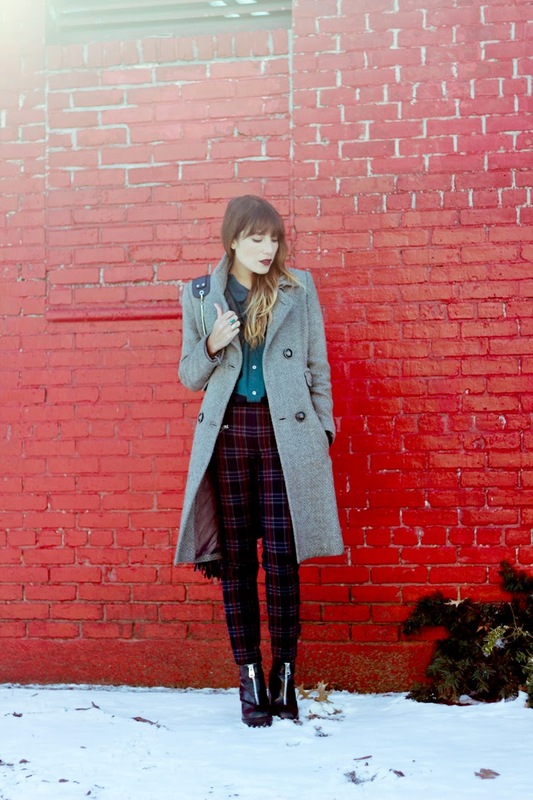 Love the plaid pants and the coat a lot! Ms. Hot Pants! Loving these.